One of the most influential theoretical framework in social psychology is the Attribution Theory. It was developed by Bernard Weiner. Attribution theory assumes that people try to determine why people do what they do, that is, interpret causes to an event or behavior. Weiner’s attribution theory is mainly about achievement. 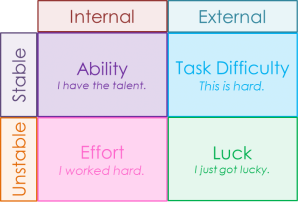 According to him, the most important factors affecting attributions are ability, effort, task difficulty, and luck. When one succeeds, one attributes successes internally (“my own skill”). When a rival succeeds, one tends to credit external (e.g. luck). When one fails or makes mistakes, we will more likely use external attribution, attributing causes to situational factors rather than blaming ourselves. 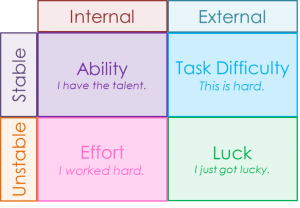 When others fail or make mistakes, internal attribution is often used, saying it is due to their internal personality factors. 3. Behavior is attributed to internal or external causes. Weiner, B. (1972). Attribution theory, achievement motivation, and the educational process. Review of educational research, 42(2), 203-215. JL, "Attribution Theory (Weiner)," in Learning Theories, January 17, 2007, https://www.learning-theories.com/weiners-attribution-theory.html.